Sonya and Sacha are Australia’s leading experts and speakers in a wide range of the adolescent and family issues Australian society is faced with today. The friends and colleagues have a mission to open up taboo discussion topics with people across Australia with a down to earth attitude – determined to make “Talking about the tough stuff easy”. Sonya & Sacha are the most experienced speakers in their field sharing their deep and entertaining insight into young peoples issues, openly tackling what most people won’t – with a positive and humane approach designed to break down barriers and assist young people in their quest for acceptance. Both women separately speak to more than 300 secondary schools each year in Australia. They bring an open discussion to the table including safe partying, careers, drugs and alcohol, self-esteem, bullying and cyber bullying, teamwork, leadership, body image, relationships as well as running parent and teacher seminars. 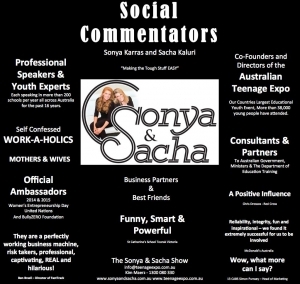 In 2010, Sonya and Sacha’s connectivity with young people led them to set up the largest youth educational event in the country, called the Australian Teenage Expo. Currently in it’s 5 year the Expo has had more than 35,000 people attend the event. In partnership with many not for profits, corporates and government bodies, the aim of the Expo is to connect young people to their potential. Sonya and Sacha funded and launched the major event brand with the belief that young people needed a platform to get connected to their own path of potential and self-respect. The event is respected as a huge success story for major corporate brands as connecting with this age group is extremely challenging. This event puts sponsors directly in front of a usually untouchable audience. Sonya and Sacha are the centerpiece of the Australian Teenage Expo, with thousands of young people travelling to hear them both speak at the event. The Sonya and Sacha messages connect profoundly with large audiences leaving the young audience to take away positive and life changing messages empowering each person to dream and connect with their true path. They have made a difference to an enormous amount of young people in Australia and are now continuing to build their brand and take their perspective to the community. In November 2014 Sonya and Sacha became Australia’s official Women’s Entrepreneurship Day Ambassadors for the United Nations. With great honor they accepted this role and to celebrate they took eleven of Australia’s Top Female entrepreneurs to climb the Sydney Harbor Bridge as a symbol of the hurdles a female entrepreneur has to climb. They interviewed each female on top of the bridge to discuss the challenges they have faced in their careers. Sonya & Sacha bring real issues and the celebration of a young person’s journey to people’s lives across the country.